For many people, tooth wear is not simply part and parcel of aging. Their teeth have worn down significantly more than what we can attribute to simple wear and tear through normal use. It was thought that overuse of the teeth occurred with the height of teeth being ground down from clenching and grinding as a result of stress. Repeated vigorous scrubbing of the teeth with a hard tooth brush every day would explain notches and grooves at the necks of teeth near the gum. However, we now know that this overuse of the teeth is only part of the problem. Sound, healthy teeth will not wear down very easily by tooth-to-tooth clenching and grinding or with toothbrushes no matter how hard the bristles or how hard we brush. Enamel is the hardest substance in the body and not easily worn down. If the enamel is softened, however, then it is much more susceptible to being worn away. The other part of the tooth wear problem is acidity in the mouth which leads to softened enamel. Anyone Can Be Worn Down! Tooth wear has become more prevalent in our modern society. It is not only a problem for the elderly but can affect children, young adults, and older people. Besides looking noticeably shorter, worn teeth are sometimes discoloured and can be sensitive to cold, hot or sweet foods and drinks. As they do not show much, if any, of their teeth when they smile, people with worn teeth can give the impression that they have no teeth at all. Besides not being aesthetically pleasing, it may also be more difficult to pronounce certain sounds and eat with shortened teeth. Sometimes it’s not just the length of a tooth that wears down, but the neck of the tooth near the gum can also wear, leaving sensitive notches and grooves. Worn teeth can lead to more severe damage such as fractures and chips in the tooth. It can also affect dental work so is best addressed before new fillings, crowns or other dental repairs. Am I Worn Out Forever? Do You Always Feel Worn Down? The reason why tooth wear occurs in some people more than others comes down to the acidic environment of their mouths as well as the protective response of their saliva. Someone who consumes a lot of acidic food and drink, such as lemon and lime and other citrus fruits, cola and other fizzy drinks, sports drinks and wine, expose their teeth to more acid and are at greater risk of tooth structure loss due to acid erosion. Someone who suffers from dry mouth and whose salivary glands don’t produce enough saliva is more at risk of severe tooth wear as they have less protective tooth remineralisation from their saliva. Some people miss out on the repair from their saliva as they do not consume enough water while others are very active or consume too much caffeine, a known diuretic, and are dehydrated. Am I Getting Long In The Tooth? When a tooth erupts into the mouth, it should be a certain length. Over time tooth wear occurs due to us using our mouths. There is a tooth wear classification system. Tooth wear by attrition occurs on the biting surfaces of our teeth when our teeth touch each other, like when we eat, or clench and grind our teeth. Tooth abrasion occurs by objects we place against our teeth, such as a toothbrush. 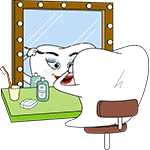 Erosion occurs when chemicals wear away the tooth surface, such as acidic drinks. Abfraction of teeth occurs at the necks of the teeth adjacent to the gum-line when they are rocked in the jaw bone, such as when teeth grinding occurs. Tooth wear management includes addressing the type of tooth wear. Tooth wear treatment for attrition and abfraction may include wearing a mouth guard at night during sleep, called an occlusal splint, to protect the teeth from clench and grinding. Tooth wear treatment for abrasion may involve using a softer toothbrush and a more gentle tooth brushing technique. Tooth abfraction and tooth abrasion repair in the form of fillings may be needed if the damage to teeth is significant. Tooth wear treatment for erosion may involve a modification of the diet to reduce acidic food and drink. Mild cases of tooth wear may only need regular review at six monthly checkup and clean appointments. Severe tooth wear may need dental veneers and dental crowns to restore the length of the teeth.